unlike most people who work for a living, Nikolai Grekh’s job is of a unique and dark sort – battling demons and saving possessed souls. the first episode in the Sin Eater serial is an introduction to Nik’s world. it is a strange one, fraught with darkness, horror, sensuality, physical and spiritual demands. the battle scenes were well-written and the descriptions of how Nik got rid of the demonic entities were quite graphic and may not be for the fainthearted. they explained what being a Sin Eater entailed and it was no walk in the park. despite the limited length, it still shed some light into Nik’s childhood and how he met his best friend Zeph. it does not explain yet how Nik came to be a Sin Eater and why he was burdened with such a task. it does tell us from the get go about Nik’s sexual orientation though. my curiosity is piqued as we have here a Catholic gay man. i would like to see how this plays out – whether his faith and his sexuality come into conflict or not, etc. the answers would probably be found in the next episodes. this collaborative take on sin eaters by Pavarti K Tyler and Jessica West was interesting and intriguing enough to make me want to read more about Nik. i know there would be a lot more to come especially after what took place at the end of this episode. 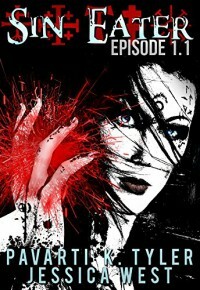 *Sin Eater Episode 1.1 is FREE 9/25 - 9/26 at Amazon so grab your copy now!